Such was the meteoric talent of Emerson Fittipaldi possessed that having queued for Graham Hill's autograph in the summer of 1969, less than a year later he would become a fellow Lotus driver in F1. The Brazilian took his meticulous and deeply intense approach to his racing, combined it with a beautifully smooth but fast style, and became the youngest grand prix winner in 1970, and then the youngest world champion in '72. He transported this overwhelming ability to McLaren in 1973 and then gave the team its first world title a year later. Having failed to succeed with a home-grown Copersucar team he co-ran with his brother, it is testament to the legendary Brazilian's enduring ability that following a 10-year F1 career he then embarked on a separate and longer one in CART. Along with the '89 IndyCar title, came two Indianapolis 500 wins. He was still winning at the age of 49. 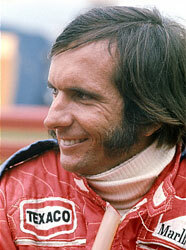 Should Emerson Fittipaldi be higher or lower in F1's greatest drivers?